Broccoli is certainly one of the most healthy foods on the planet. And while most kids do not care about it, broccoli is respected by adults for its many beneficial effects. Broccoli is filled with nutrients which the body needs, and has been shown to contain substances that help reduce the risk of many disorders, including cancer. Broccoli is available almost anywhere and is one of the least expensive vegetables you can buy. There is a lot of research on the positive effects you get from consuming broccoli. Eating broccoli can, among other things, reduce the risk of inflammation and stomach cancer, prostate cancer and for other cancers. It can reduce the risk that already detected cancer will become more aggressive, it has a rejuvenating effect on the immune system, and it can prevent cardiovascular disease. It can also prevent or delay the development of HIV, Alzheimer's disease, Parkinson's disease, and early aging. Almost halves the level of gastric ulcer bacteria. Chlorophyll and sulforaphan are among the most beneficial substances we find in broccoli. Chlorophyll can protect the DNA molecules in our cells from damage - by, for example, absorbing toxic compounds and harmlessly so-called free radicals. In recent years, much research has been done on the glucosinolate sulforafan. Sulforafan has a beneficial effect on, among other things, infections with Helicobacter pylori ("gastric ulcer bacteria"). In a study where half of the participants ate broccoli sprouts daily, this group reduced the level of the amount of antigens with H. pylori by more than 40 percent. The amount of antigens is a specific target for the presence of H. pylori and measured in stools. Eight weeks after the participants in the study stopped eating broccoli daily, the levels were back to normal. Helicobacter pylori is a bacterium that can cause gastric ulcers and contribute to the development of gastric cancer and dense blood vessels. Broccoli has been grown in Tromsø and Grimstad, Norway, Berlin in Germany and Galicia in Spain - from 69 to 43 degrees north. This attempt has also provided many answers. Perhaps the most important thing: A cold period before harvestproduces more vitamin C. Broccoli is therefore suitable for cultivation in the cold, Nordic climate. 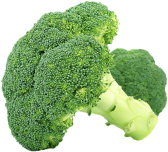 Through the use of advanced biotechnology methods, postdoctor Sidsel Fiskaa Hagen and colleagues have been working to find out how the biochemical interactions of broccoli is affected by external stimuli. The substance, sulforaphan, can kill the bacterium Helicobacter pylori, shows new research. This bacterium is responsible for most cases of peptic ulcer. Even antibiotic-resistant bacteria must be lost to this substance, writes BBC News. The study is performed on mice, but now researchers will conduct clinical studies on humans. They hope to show that a diet rich in vegetables containing sulforafan can help against H. pylori infections.